Hürth/Mumbai, 13. July 2012. TALKE Group, one of the leading logistics service providers for the chemical and petrochemical industry in Europe, the Middle East and Asia, opened its first site in India at the end of June. 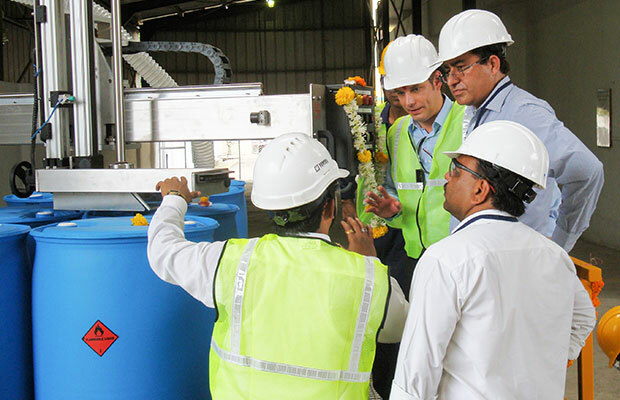 TALKE now operates an acetic acid drum filling line for the pharmaceutical and life sciences company Jubilant Life Sciences Ltd.
TALKE erected the state-of-the-art drum filling line on the premises of a tank storage facility in Mumbai. The acetic acid can be fed into the filling line straight from the tanks, but can also be filled directly from ISO containers. Initially, the TALKE facility will drum about 12,000 metric tons of acetic acid per year. If required, however, volumes can be increased and a number of other substances handled. Jubilant is the largest Custom Research and Manufacturing Company in India and is among the ten largest contract manufacturing and outsourcing experts in the global pharmaceutical industry. “We always apply the highest standards to all our research and production projects. In TALKE, we have found a logistics partner who has implemented equally high quality standards in terms of safety, health and environmental care,” says Rajesh Sethi, Vice President & Growth Unit Head Acetyls at Jubilant. The contract will run for an initial term of two years and is then automatically extended indefinitely. “Our aim is to support the chemical and petrochemical industry with topquality, safe, and specialised logistics services wherever its commodity flows run together. Jubilant is the first customer on the Indian subcontinent to whom we are delivering our high TALKE standards,” Alfred Talke, TALKE Group's Managing Director, explains.